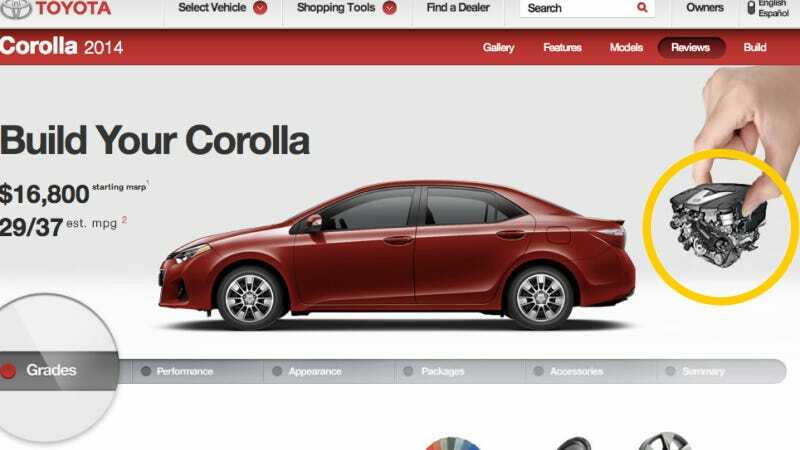 If you ever needed hard evidence that the 2014 Toyota Corolla, despite an attractive redesign, is more about value than engineering look no further than Toyota's own website. They seem pretty confused about what kind of engine it's supposed to have. Of course, we all know that the 2014 Corolla has a pair of thrilling 1.8-liter four cylinder motors to choose from. But the engine pictured on that website is very obviously not one of them. Reader CaptainSpadaro points out that the motor pictured at the bottom of the page, the one being held up by a giant hand, looks to be a newer Mercedes-Benz CDI diesel V6. The photo is small, but I think he's right. At any rate, that's clearly no 1.8-liter four, although I wish a Mercedes diesel V6 was an option on the Corolla. Maybe it's coming in the 2015 refresh. Perhaps this is a subtle hint from Toyota on what's to come rather than a stock photo fail? German diesel V6 Corolla FTW!